Sometimes with a new boot, it makes sense to have a visually labelled breakdown to really understand what the boot is all about. 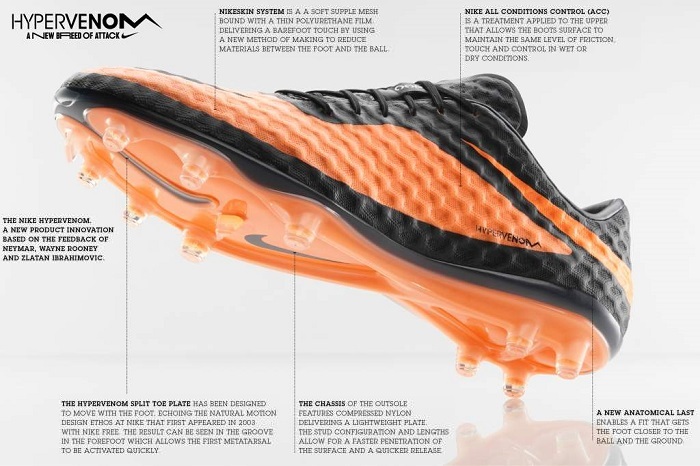 As you can see, there is a whole lot of NEW going on with the Hypervenom, released earlier today. Considering the fact that they are replacing the Nike T90 Laser range, it makes sense to create a whole new type of shoe. These boots are less about power and more about being agile, as the 7.2oz weight will attest to. The upper design is pretty radical and already reaction has been mixed – but mark my words, these will be popular and after the 2nd or 3rd colorway players are going to be loving them. The Hypervenom is already available to order from WeGotSoccer for $202 or Soccer.com for $225. Stay tuned for more updated images and an UNBOXED video to follow shortly! I need to buy a couple of T90 before they are out. Wegotsoccer got the lime green on sale, but I want the mango ones. I've noticed that some press images have the 3 stud heel design (two conical, 1 blade), and some have 4 (all conical). Most of the images on pre order sites completely avoid showing the heel section of the soleplate. I'm interested to see what design ships. Definitely the 4 conical design! The 3 stud heel design were on samples (aka what gunt22 got). The actual boot itself that will ship will have the back 4 like normal. Love the cleat, hate the color and look. Hopefully the new releases of the colorway will be much better. I'm not in love with the all over dimple look either. Maybe in certain areas where ball contact is made would be good, but all over makes you look like you have some sort of foot disease. Why are they cheaper at wegotsoccer? Why does everyone like the T-90s?